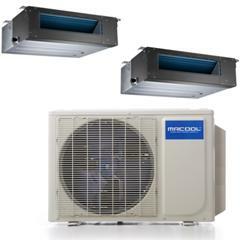 A MRCOOL DIY Series heat pump is the only ductless mini-split system on the market explicitly designed for amateur installation. You don’t need special tools or training to install this high efficiency heat pump. 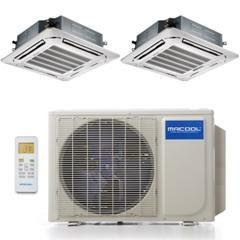 The line-sets pre-charged with R410A refrigerant, the quick hook-up electrical connections, and the quality engineering mean just about anyone can install a MRCOOL DIY in their home with no problem at all in only a few short hours. If you want great air comfort without paying an arm and a leg for installation, you want an easy-to-use MRCOOL DIY Series ductless heat pump. 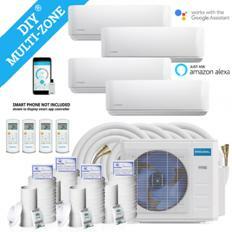 NEW - WiFi functionality - Using your smart phone - get home to a comfortable environment! Do It Yourself easy installation. You can install this ductless system without and special tools, equipment, or training. Simple connections, Pre-charged R410A Quick Connect Line-set. These unique line-sets are a cinch to get working. Auto Restart. Never lift a finger. Power Outage? Don’t worry, the Mr Cool auto start will power is restored. Leak Detection. When Mr Cool detects low coolant an alarm will sound to alert you to the problem. This will prevent damage to the compressor. Temp Compensation. Fast and Automatic. The system constantly monitors interior air temperature in order to deliver the maximum possible comfort. Sleep Mode. 24 hour Comfort. We made sleep mode easy to program to save you money, let you sleep easier. Louver Position Memory. Remembers so you don’t have to. Horizontal louver will automatically move to the same position as you set it the last time the unit was turned on. Gold Fin Condenser. Corrosion Resistant. Live on the coast? Don’t worry, our condenser is built to resist long term corrosion. Low Ambient Heating. 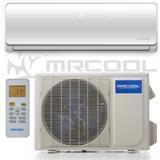 Mr Cool is a heat pump system designed to keep you warm in the winter. 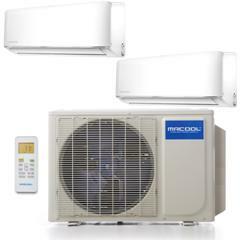 Our ductless mini-split systems are design to give you comfort all year round, even when temperatures get as low as 8 degrees F.
The MRCOOL ES Oasis Series ductless heat pump is the air comfort system you need to ensure your home stays comfortable, cool, and cost effective for as long as you desire. This high quality ductless heat pump is energy efficient, packed with great features, and priced to meet most household budgets. If you need targeted air comfort for a single zone in your home or need more general air conditioning, a MRCOOL Oasis Series ductless heat pump should be exactly what you’ve been searching for. After all, shouldn’t your home be your oasis? Follow Me: Keep the remote close by, and MRCOOL Oasis will track the air temperature around you ensuring maximum comfort. Auto Restart: In the event of a power outage, MRCOOL Oasis restarts automatically when the power returns without you having to lift a finger. Auto Swing: You can set airflow to personal preference, or allow MRCOOL Oasis to automatically distribute air evenly throughout the space. System Protection: MRCOOL Oasis automatically detects when internal coolant levels drop too low. It will alert you to the problem before the compressor is damaged or air comfort degrades. Low Ambient Cooling: Need to keep a hot kitchen or computer room cool even in bad weather? Low ambient cooling will prevent heat exchanger frosting all winter long. Cold Catalyst Filter: The cold catalyst filter collects bacteria and other odor causing pollutants to purify the interior environment. It will leave indoor air cleaner and sweeter. 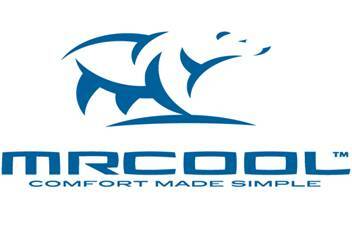 Turbo: When you need air comfort as soon as possible, Turbo will help you get there quickly. Louver Position Memory: Set the louver to direct the air exactly where you want it to flow. 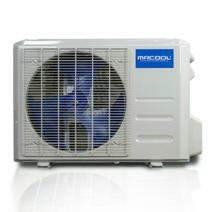 MRCOOL Oasis will remember your preferences, and set the louver accordingly every time you turn it on. Flexibility Meets Comfort and Efficiency. 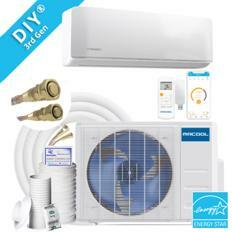 Indoor units are compatible for both single and multi inverter systems. Handy for multiple rooms and warehouse management. Intelligent on-off technology enables MRCOOL Oasis to automatically enter energy-saving mode whenever you set the standby function. This can reduce household energy consumption by up to 80%. Extra Room To Find Your Happy Medium. 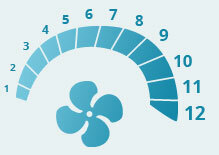 The 12 stage indoor fan speeds ensure more accurate control and creates a more comfortable air flow. Making more out of less is the best way to conserve energy and the environment. MRCOOL Oasis is designed to operate on a fraction of the electricity needed to power many previous generation air conditioning systems. The OASIS ES Series offers added benefits as shown below. The Advantage Series offers a financial value and superior performance, the MRCOOL Advantage Series is, quite simply, one of the best valued ductless heating and cooling systems available in the marketplace. This high efficiency system is packed with innovative features, advanced technology, and components refined over a century of heating and air system development. Not only does a MRCOOL Advantage Series heat pump ensure high efficiency operation, but it also delivers the quality you would expect from a performance leader. System Protection: MRCOOL Advantage automatically detects when internal coolant levels drop too low. It will alert you to the problem before the compressor is damaged or air comfort degrades. Price a subject to change without notice. ETL Certification and AHRI Listed. Compact design of outdoor unit. Call to design a the perfect system. Your choice of vents are ceiling cassette style, ceiling recessed, and wall mounted. 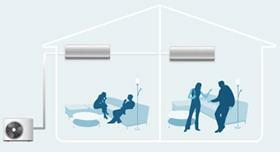 It is possible to mix and match for your specific needs, and mix match the BTU’s needed for each space. Each vent is self contained with it own coil and blower. No ducts to run. Each vent is connected to a Freon circuit going to and from a condenser. These are Heat Pumps so you get AC and Heat. 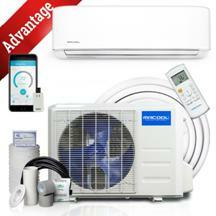 The Zone series comes with your choice of 18K BTU,27K BTU, 36K BTU, and 48K BTU. You can use two 12K or mix and match a 12K with a 18K or 12K with a 24K or 18K and 24K. 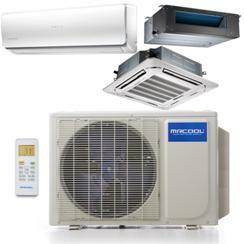 These systems allow your to custom design the AC & Heat you need. The Condenser size is determined by your choice of tonnage needed. The ceiling recessed and wall mounted vents are available in 9K. Perfect for smaller areas. Please email us or call and allow us to help you design your system to fit your needs. For the Oasis Hyper Heat Series—Call Us!